What does it take to maintain a deck properly? 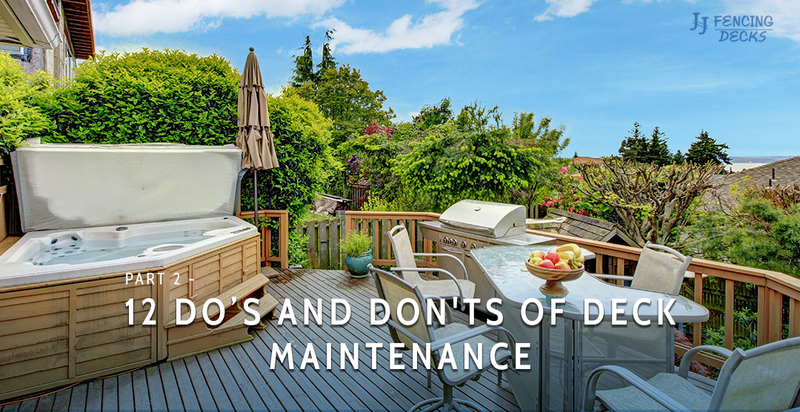 Not a whole lot, but we want to share the 12 dos and don’ts of deck maintenance with homeowners in Fort Collins. In the last post, we shared the first six tips, and in this post we’ll share the last six tips deck maintenance tips. However, if you’re ready to get started on your deck project, feel free to give JJ Fencing and Decks a call today! Furniture, rugs, and other components can trap moisture against he wood, which can lead to mildew, mold, and rot. If you wash your deck regularly, consider adding a furniture move every six months to keep moisture from building up and eating away at your deck over time. Sometimes we find stains in our wood from components, features, or a spill. This is normal if you own a deck for a while. However, you don’t want to attack the stain with a wire brush. The stainless steel bristles will tear apart the wood causing irreparable damage, which decreases the lifespan of the wood. Instead, consider using water, a soft scrub, or wait until you can power wash it. Popped nails, warped railings, or split boards can be a pain to fix. You can either call your local deck contractors in Fort Collins or do it yourself. We suggest you get the damage fixed as soon as possible to keep you, your family, and your pets safe from injury. Sometimes we may think that washing our deck often is a good thing. However, washing your deck too often, either with water, cleaner, or otherwise, can negatively affect the wood. It’s getting pounded by UV rays and the weather all year round. Adding a routine cleaning schedule can age the wood faster, causing more damage like warping, splitting, or popping. Power wash every few years. Hand wash the deck once or twice a year. Potted plants and other planted flowers or foliage can be a great aesthetic and ambiance addition to your outdoor space. If the potted plants are on your deck, consider adding small irrigation channels to remove excess water and moisture. Sometime we over-water our plants, or if a heavy rain come through, it can flood our plant pots. This means water and moisture is getting trapped or puddling on your deck. Creating some kind of irrigation ensures mildew, rot, and mold don’t begin to form. Primer and paint will seal moisture into the wood that will eventually work through the paint. Also, as the paint ages, it will flake an dchip, which means you’ll need to either remove it all and paint again or simply remove it to stain and seal it. Unless it’s absolutely necessary to smooth out your deck surface, you’re creating more work by sanding it before you seal it. Once the deck is sanded, you will need to apply multiple coats to stain and sealant to finish it properly. If there is an older stain on the deck already, you can simply apply one or two layers of seal to get the job done. After years of serving the Fort Collins Residents, we understand what it takes to build the best deck for you. Our excellent customer service and professional deck installation technicians are sure to make your vision become a reality. Ready to get started on your deck project? Call us today!